Brooke Smith (often misspelled Brookesmith) is an area that has had a remarkable transformation. It had always been “on wrong side” of N Main; the less desirable side. That has changed tremendously. Less than two years ago, tear-downs (or remodel projects if you were brave enough) were selling for $80-$100k. Now, the majority of Brooke Smith”land value” homes in the last 4 months sold for $165K to $195K.These are 5000 SF lots, so prices average ~$34/SF for Brooke Smith land value. There was one property that sold for only $109K after being on the market for almost 9 months. I don’t know what the problem was with it. I am attaching a pdf of Brooke Smith Land Values, on the market or sold since last September. Ignore the $/SF shown, it refers to the SF of the structure, not the land. Divide the price by the SF of land to get land price/SF. These reports are a little cryptic, but you should be able to decipher it. Call if you have questions. Here is the transformation: Compare the land value of a typical Brooke Smith home of $170K to what this would have bought under two years ago. 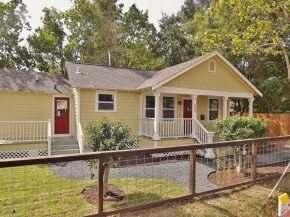 609 Pittman, a small (984 SF) but beautifully redone 2/2 sold for under $175K two years ago. $175K would buy a gorgeous remodeled home, now it buys a remodel project or a tear-down. One last comment. My biggest Realtor gripe…crappy photos. Check out the second property on the pdf list link. What the hell is that? I can’t tell. If the Realtor can’t get out of the car to take photos, he should at least slow the car down when taking them. Sheesh!